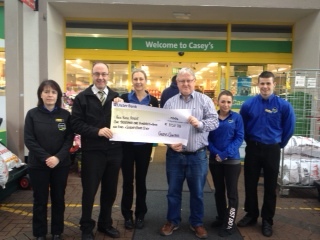 Sincere thanks to the management and staff of Casey’s Centra, Castlebar who organised a Charity Walk recently in aid of Mayo Cancer Support, Rock Rose House. Thanks also to all who took part in the walk or gave sponsorship. A total of €1,115.78 was raised on the day. Pictured here is Padhraic Barrett receiving the cheque from Aiden Hennigan and the staff of Centra.